I was contacted by the author of The Big Serious Guitar Book, Geoff Stockton, asking if I would like to receive a copy and write a review, and since I'm always on the lookout for new guitar material, I said sure. This self published book sells for around $40 on Lulu. When I first saw the rather steep price, I got curious. Most guitar books sell for $5 to $20. What could this have that would warrant the price? 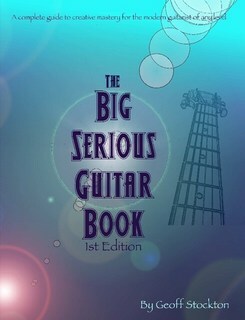 The first thing I noticed was that The Big Serious Guitar Book is just as it's name says. BIG 🙂 In fact, it's over 500 pages big. Looking through my library of guitar books, I could not find any other book nearly as long. Secondly, having a quick peek at the contents, it has a wealth of information that you won't really find in one place anywhere else. In essence, this book could easily replace several other books based on the amount of content presented. So my first impression was basically positive, now let's have a look inside. I don't know about you, but the first thing I like to look at when I'm looking to buy a book is the table of contents. You can pretty much instantly tell whether it's right for you or not. Wow, I don't blame you if all of the content is overwhelming at first sight. There are a lot of topics that most guitarists and musicians probably have never heard of, which is great, since this book may finally fill those gaps of knowledge that a lot of musicians have. This brings us to an important topic. When I first looked at the table of contents, I was a bit confused, since it starts out with very basic beginner stuff, and gradually moves into very advanced theory. After going through the book, I can safely say that the book is not for beginners. Intermediate players? Well, maybe and maybe not. If they want to take it to the next level, advance and dive into the world of theory, than definitely. Nevertheless, I feel it is the more advanced player that will get the most out of The Big Serious Guitar Book. The beginner stuff is interesting to read, and Geoff has a descriptive, easy to digest style of writing, but beginners need more attention than what the initial chapters of the book can provide. But that's OK, you can't have everything in one. There is lots of other stuff out there for beginner guitarists, like my beginner's guide for example. Simply put, The Big Guitar Book explains guitar theory in a very practical manner, and gives you lots of examples to practice theory in context. If you’re playing rhythm guitar or comping over a vamp that shifts between two chords, a solid knowledge of these combinations will allow you to move anywhere on the fretboard with ease and grace. This allows you to duck and weave out of the way of a vocalist, soloist or keyboardist, which will lend a much more concise overall sound to the band. The guitar theoretical concepts are explained in a very descriptive and understandable manner, which is rather uncommon. Try looking elsewhere for specifically guitar theory content of this depth and quality... pretty hard to come by. Most other guitar theory material stop at scale modes and the CAGED system. Well, not this book. Have a look at the table of contents again. Even if you call yourself an advanced player, I'm 100% sure you will find lots of theoretical stuff that this book will clear up for you. I'm also 99% sure you'll find brand new material you've never heard of before. The amount of theory in this book could be almost overwhelming, but it's not. The Big Serious Guitar Book wasn't meant to be read and digested in a week, or a month, or even in a year. Starting out with the simpler theoretical concepts, like scale tones and the 12-bar blues, all the way to key modulations and jazz, everything is explained as clearly and understandably as possible. As I mentioned, every theoretical concept explained is accompanied by practice exercises. At times, there are several pages of exercises on a given concept, which aims to get the reader familiar with it's sound across the entire fretboard. That is awesome! It really shows that the author wanted to demonstrate every aspect of any given topic. Oh yes, I want to emphasize that to get the most out of the book, you need to have your guitar in your hands and follow along musically. Everything is detailed and basically fun to read, even aspects that most teachers would not provide that much info on. It's cool how the author gives practical advice, examples and tips on even heavier theory as well. Why this is important? It's because he writes in a way that allows you to picture things in detail, which is very important, since there is no video to accompany the material. But of course, you need to have your guitar handy. Also, the language he uses is very straight forward, like he was talking to a friend, which makes all the music theory stuff very readable and story-like. Here is an example of using clear, understandable and descriptive language is his explanation on the important of intervals. Understanding and recognizing these intervals is even more important than knowing the names of the notes because it’s the relationship between two notes that creates musical characteristics and qualities that effect us. Basically, the book has a wealth of information on pretty much every guitar related topic, but I can imagine that the fact that it's just so BIG will put some people off. In today's fast paced world, not many have the time or motivation to dive this deep into guitar theory. Advanced guitarists, or intermediate players who are interested in deeper theory should definitely get this book. Adding chapter and subchapter numberings. The practice exercises on each theory section is great, but I would also give real world examples in the form of famous songs/compositions that use the given bit of theory. Associating theory with a known song can really put things into context. Making the front cover and the layout of each page a little more eye-catching (the "Dummies" series does a really good job of this). Adding a final, conclusion chapter on where to now, how best to utilize the newfound knowledge, etc. But these are just little nuances that would make an otherwise great guitar theory book even better. First off, a big thank you to Tom for an awesome review and some very good advice for the second edition. I’m hoping to do a new edition every 4 years and release lots if other books in between editions of what will probably remain my flagship product, the Big Serious Guitar Book. Secondly, I have recently posted some rather fat sample PDF chapters of the book on http://www.geoffstocktonmusic.com, in the instructional section. So if you want to be sure this book is worth the admittedly robust price tag, have a long look at the samples and I’m sure you’ll see what Tom’s talking about!